Car fans call a car "youngtimer" if it passes the check for veteran cars but it is not old enough to be a real oldtimer. I think "Car Chassis" no. 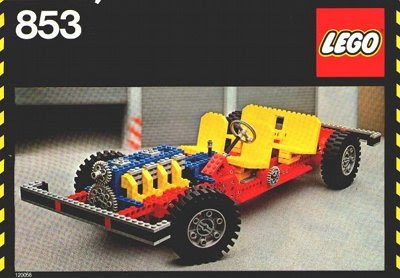 853 from the beginning of the Big Technic Car history fits this description since it was first sold in 1977. As I have blogged before, I have set myself as a long term goal to get all the cars from the Big Car series. (Well, the first five at least.) It looks like Santa listens to my wishes well since the postman has brought me this set yesterday. At the first glance it is in an excellent shape as a real youngtimer should. Of course I will not build it until Christmas. LEGO® is a trademark of the LEGO Group of companies which does not sponsor, authorize or endorse this site. This site follows the LEGO® fair play policy.